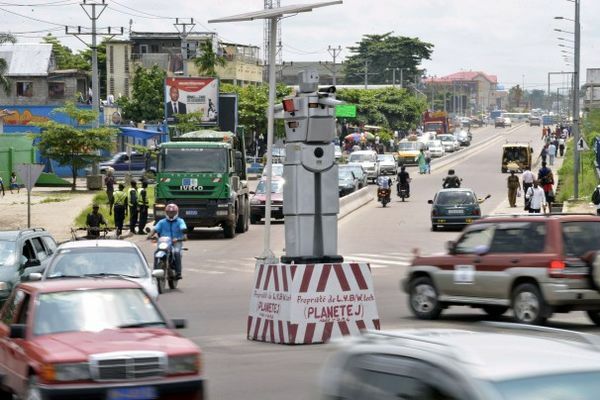 Kinshasa, Congo has introduced and planned to replace the traffic police and traffic lights by robot traffic humanoids. The giant police robots have four cameras and revolving traffic light arms. 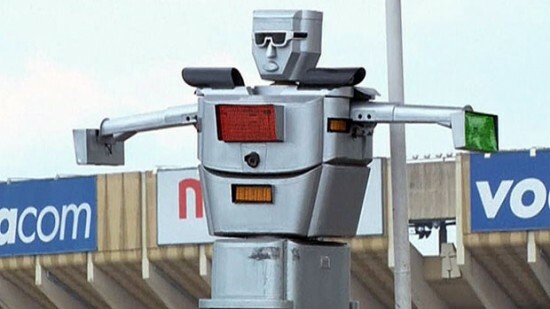 Interestingly the robots have sunglass the Kinshasa police wears. These robot policemen are doing very good work. Initially it seems these are only tin boxes, but people have given a good response to the chosen IT technology. These eight feet tall robots are made of aluminum and stainless steel plates. The solar panels give power to the four cameras fitted recording the traffic flow. Initially commuters did not pay attention but now the psychological effect has improved their response. Some people criticize these robots for being only machines. Objections are raised that in cases of serious accidents the robots can not do not any thing worthwhile to control the situation. Since their installation it has been noticed that commuters do not ignore the robots for the traffic control. Earlier the problem was severe, the traffic lights or traffic cops were unable to control the erring drivers. The IT engineers of Kinshasa Advanced Institute of Applied Techniques, have created these robots. The data center analyzes the information collected and serve dual purpose of controlling the flow of traffic and issue tickets to the erring drivers. The revenue collection has gone up and it should result in improvement of the building more roads and safety structures. The organizers are watching the results to take the future course of action to take and decide what the future of of the traffic humanoid ought to be on larger scale. The police and city elders believe it is a change for the good.